Looking for the right plastic pallet supplier? There is a range of benefits associated with plastic pallets. Plastic pallets are increasingly popular in a number of applications and depending upon which type of job you are talking about, the requirements of the pallet can vary. Before listing pallet vendors below, let's take a look at the major types of applications. Durable plastic pallets for applications involving warehouse racking and stacking. High quality plastic pallets are prized for their extreme durability and precise manufacture. They come in a variety of edge racking and load capacity ratings. Based on your application, vendors will match a product that meets your needs. Additional features may be of interested such as flame retardant additives, design for ease of washing, as well as other features. In food production environments, Barium sulfate may be added to a pallet so that X-ray detectors will identify and broken pallet particles that find their way into food production. Likewise, metal flake added to a plastic pallet will enable any broken pallet particles to be identified by a metal detector. Distribution pallets provide durable performance, but may not be suitable for stacking or edge racking. 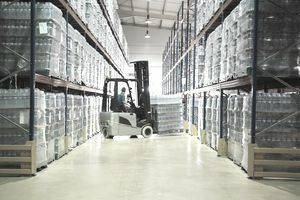 Another well-established application is the use of plastic pallets for distribution. Plastic distribution pallets are extremely popular for grocery products distribution to retail stores. Another well-established application is with the U.S. Postal Service. Distribution pallets are typically thermoform pallets or injection molded. Oftentimes, distribution pallets are not suitable for racking and are more properly labeled as skids rather than pallets. Lightweight shipping or export pallets eliminate concerns of ISPM-15 compliance. Inexpensive lightweight pallets have become increasingly popular in the role of export pallets, where they avoid any issues around ISPM-15 requirements for timber pallets. Pricing for lightweight export pallets can start around the $10 range, however, companies often pay more to ensure a better performing pallet where the demands of the application make it prudent. In terms of price, durable plastic pallets often start in the $50 to $80 or more range while lightweight export pallets begin in the $10 range for truckload quantities. Distribution pallet pricing is more in the mid-range between these two extremes. Here is a list of pallet suppliers. Usual due diligence is recommended before embarking upon any relationship with companies listed below.